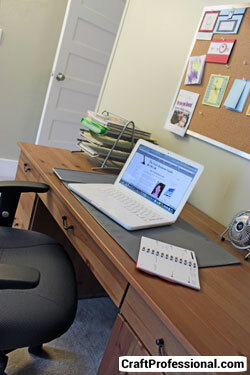 Starting a business from home carries a lot of perks. You can keep expenses low, earn some extra income, ease into your new venture without having to give up your day job right away, and you maintain a lot of control over your work environment. However, there are also plenty of challenges inherent in working from home - many you'll never fully appreciate until you get started. 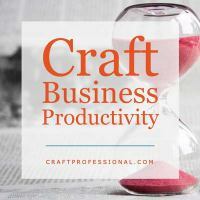 The biggest challenge for many solopreneurs, myself included, is managing your time. When you work from home, your work life and your personal life tend to spill over into each other in ways that you don't experience when your work space is outside of your home. Personal distractions at home can make it tough to focus on work, and, because you never leave work, it can be tough to let it go and devote time to your personal life. I've been working from home since 2005. The first few months were a bit of a shock, and I needed to make some big adjustments. I'm certainly not perfect, but I have learned a lot over the past 10+ years. I've worked hard to find useful strategies to focus and be effective and efficient when I'm working, and to put work aside when I'm finished so I can recharge and enjoy free time. I hope you'll be able to learn a few things from my experience, and maybe avoid a few of my mistakes! If you're in a hurry, click on one of the links below to jump to a specific topic on working more efficiently in your home business. If you have some extra time, read through the full page, clicking on links for more detailed information on any topic that interests you. Here's the simple, and inexpensive tool that helped me to write three times more articles for this site than I've written on average over the past ten years. It's made a huge improvement in how I manage my personal time and my work time. Sadly, this is not my home office! This is how people think I work. 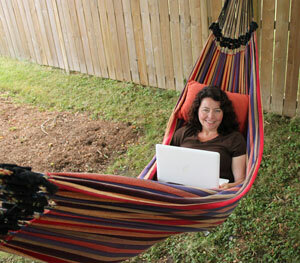 I'm afraid nothing would ever get accomplished if the hammock in my back yard was my regular work space! When you start working from home, you may have visions of bringing your laptop out to your sunny backyard with a cool drink beside you, and lounging on your deck chair as you write up your marketing plans. That sounds pretty great, it's a little fantasy of mine, but it is a far cry from how I really work. 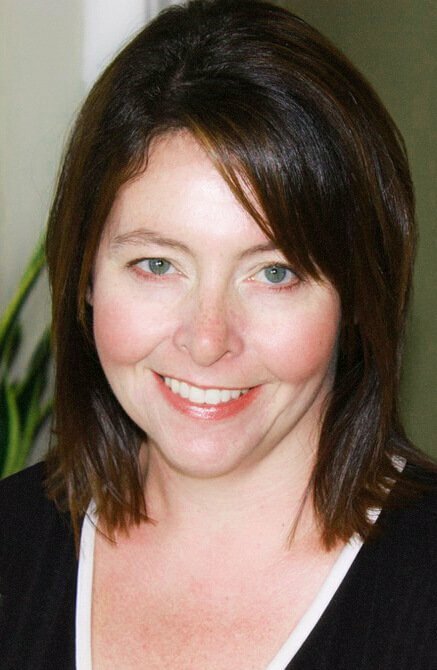 Starting a business from home can be more a matter of sitting in your spare-bedroom-turned-home-office in the twenty spare minutes you have between dropping your kids at school and doing the dishes and trying to work out the math to figure out how you spent so much money on supplies that month. Then trying to resist the urge to shove all of your receipts in a shoe box and avoid telling yourself you will most definitely organize them later. Most of the time, it's somewhere in between those two extremes, and with some good planning, you can minimize the stresses. For me, the freedom to be flexible with how I use my time, and the satisfaction of building something that is my own from my own creativity and hard work is well worth it. 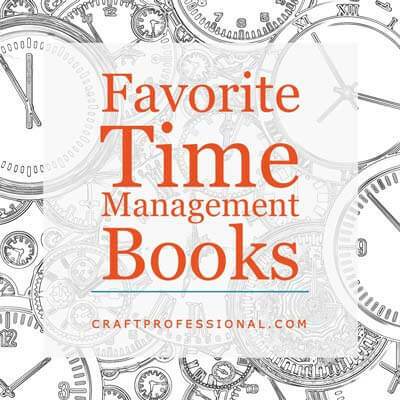 I've read a lot of time management books. Most of them, honestly, were a waste of time (ironic, I know). 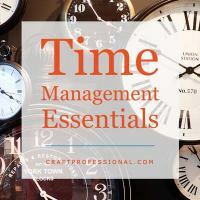 But I have found a few time management gems that I love and that have changed the way I approach work and life. These are my favorite books on the subject that are packed with ideas that could truly alter the way you do things. 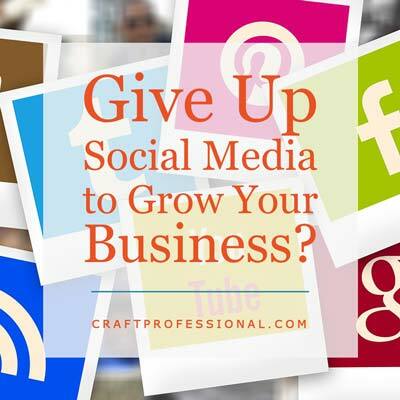 Is Social Media Destroying Your Work? We're not talking only about the time you spend on social media, but, more importantly, the effect social media and other distractions have on your ability to focus deeply and do you most complex and meaningful work. Here's why you might not be doing your best, most important work and how to change that. What if better time management isn't the key to thriving? What if there's a much more important skill that many of us have lost that truly holds the key to accomplishing your goals and feeling successful? 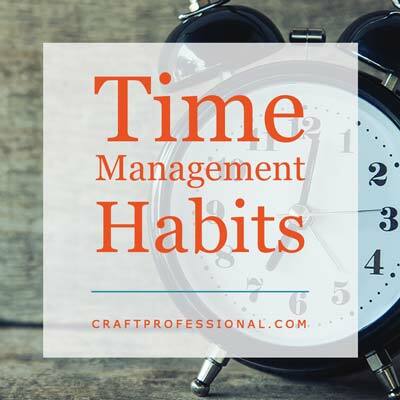 Too many time management strategies depend on you having total control of big chunks of your time, which is not a luxury many craft professionals working from home have. These 5 time management tips are strategies you can actually use, even if you're working from home and juggling other responsibilities. 4 essential time management truths that have served me well, and I wish I had learned much earlier in my life as an entrepreneur. 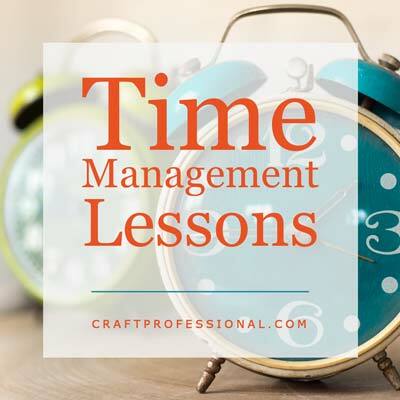 I've spent a lot of time reading lessons from time management experts, but there's one lesson that stands out as the single most important one that helps keep my business and my life on track. We assume productivity is king. 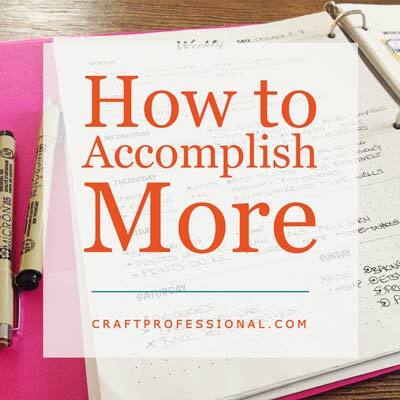 We should do more - be more efficient - cram more into each day. But what if, instead of doing more, we committed to doing less better? If you're going to truly master your craft, you'll need to commit to a lot of focused, challenging practice. Keeping up with your practice takes a good amount of self motivation. 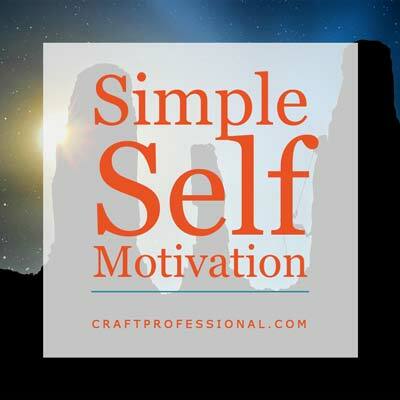 Here are 9 strategies you can use to keep yourself motivated through the tough work of building a craft business. I'm learning and practising all I can about cultivating good habits. I'm convinced a big key to achievement and happiness lies in your habits. Here's some exciting new strategies I've learned for developing effective habits. Have you heard about the bullet journal? It's a simple, extremely flexible way to organize yourself. Plus, you can unleash your creativity and make it as beautiful as you like. 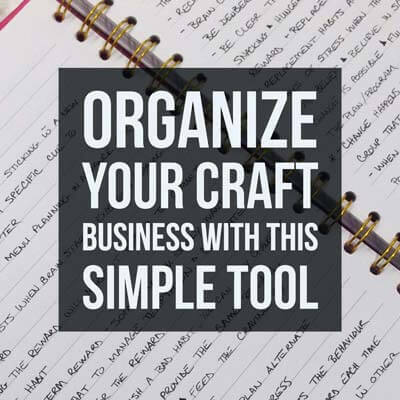 Check out this tool that can help you get organized and accomplish more. 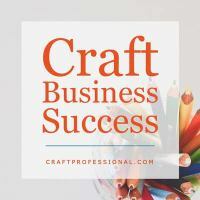 4 simple tasks to help get your craft business started on the right foot. You can even do some of these before you're ready to seriously start work on your business. Our daily habits have an astonishing impact on our lives, both work and personal. Here's how I learned to take better control of my time and consciously cultivate effective work habits that move me toward my business (and personal) goals. 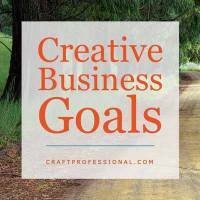 Building a craft business can feel like a pretty audacious dream goal. 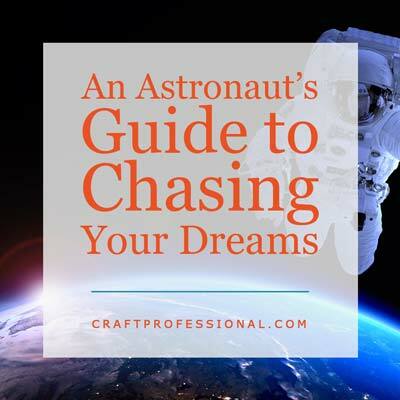 This summer, I learned from an astronaut how to minimize the risk inherent in chasing a huge goal. Here's how to go after a dream without risking everything. 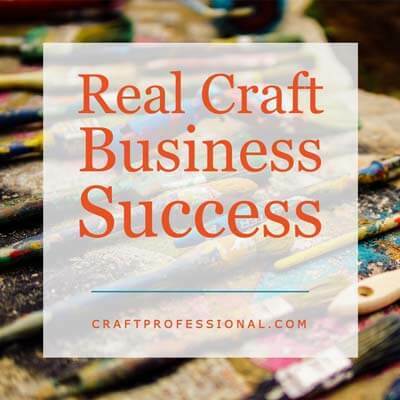 Here's a surprising way to make sure your craft business truly becomes a huge success for you. 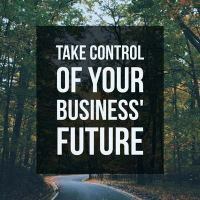 Without long term goals, your business is just floating from day to day. Your dreams are just vague, unexamined hopes without direction. Here's how you can look at the big picture and start turning your dreams into reality. 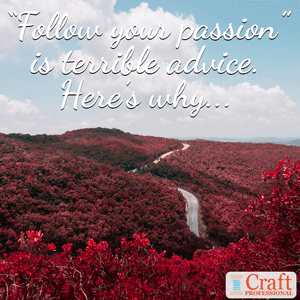 I'm sure you've heard the advice that you should follow your passion, and success will follow. I cringe every time I hear someone say that. Here's why that advice is harmful and what you should do instead. SMART goals are awesome! These are not the useless little goals you write down one weekend only to forget about them a week later. SMART goals are tools that help you to achieve your ambitions. 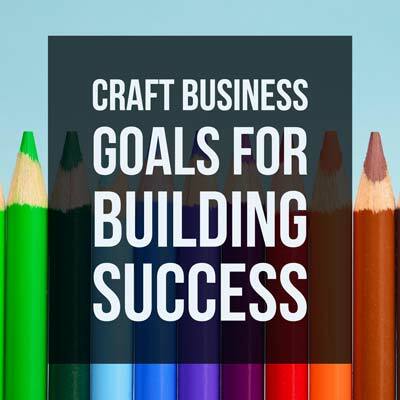 Find out how to develop goals that actually propel your business forward. If you know you need to set long term goals for your business, but you don't have the first clue where to start, this article is for you. Are you setting goals that are completely out of your control? There's a good chance you are. A lot of people do. I catch myself doing it even though I know better. The problem with setting goals that are not largely within your control is that you might not reach them even if you've done your absolute best work. 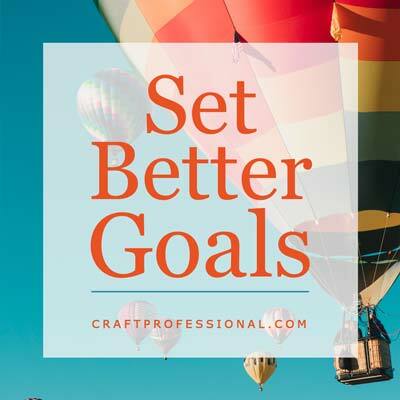 Here's a better way to set goals that set yourself up for success. 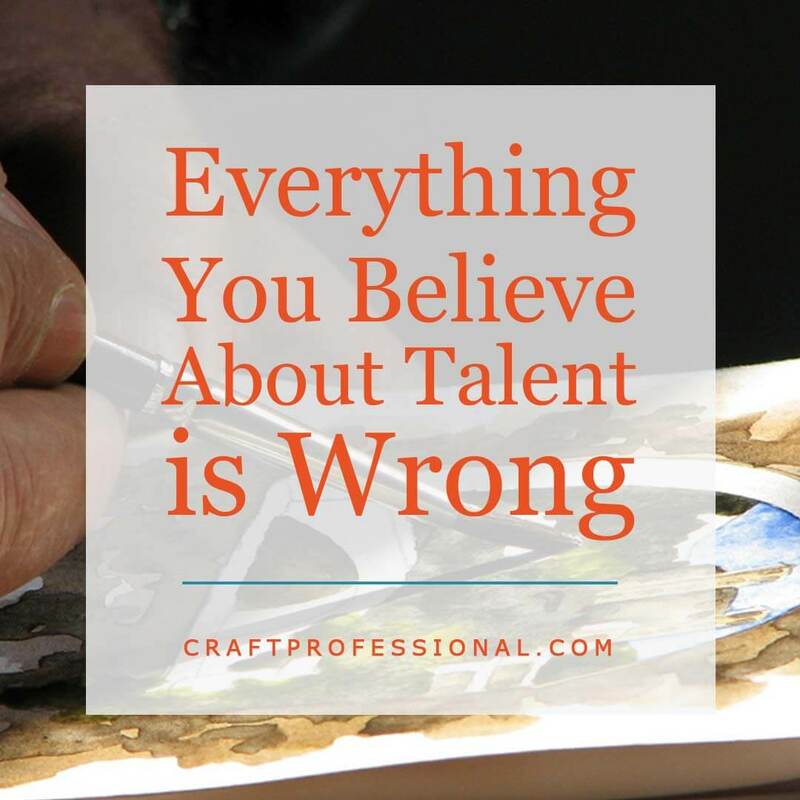 Do you need to reassess everything you believe about creative talent? The leading experts on learning and achievement think most of us hold beliefs about talent that are terribly wrong and hold us back from achieving our biggest goals. Here's how to change your thinking to achieve your goals. It's true. You can learn anything as long as you're willing and able to do the right kind of practice. Hard work isn't enough; you need to commit to the right kind of work. 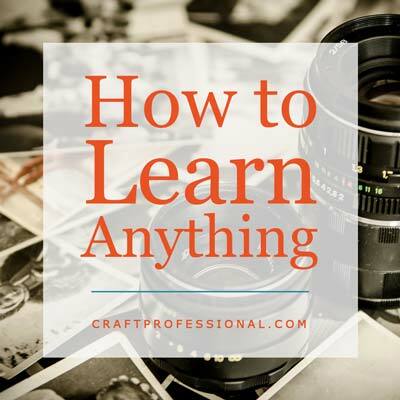 Here's how to learn anything you need to be able to do to build a thriving craft business. 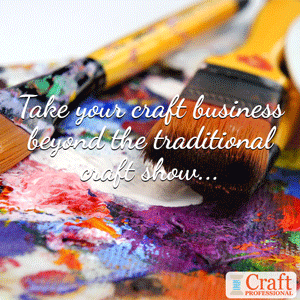 Do You Have the Skills You Need to Build a Craft Business? 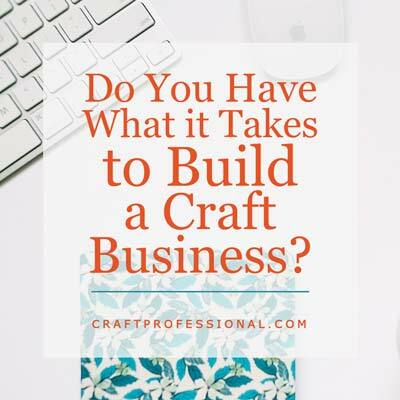 Do you have what it takes to build a craft business? A transferable skills analysis will uncover your strengths and find areas for improvement. You truly need to develop an excellent self-knowledge to effectively run a business. In the course of building my business, I've definitely become a more self disciplined person, and I've developed a better awareness of my strengths and the things that hold me back. When you're a solopreneur, nothing gets done if you don't do it. For the most part, you don't have the strengths of others to draw on and balance out your own natural tendencies. That's why it's crucial you're aware of your strengths and weaknesses so you're not held back by your blind spots. I started trying to do hands-on work wherever I had space and do my computer work in an area that was completely open to family activity. Big mistake! The photo on the left shows where I work now. It's not as comfy as the hammock in my back yard, but it is a good, quiet place to focus. And when I close the door, people know I'm working and need quiet time. 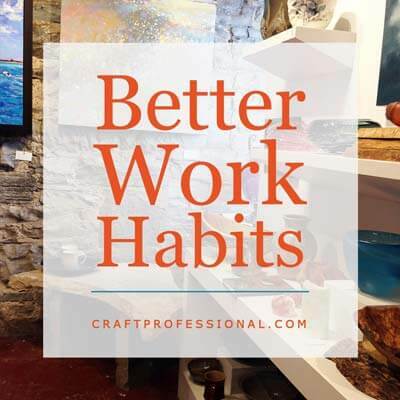 You might get away with having a less defined work space if you live alone and are very disciplined, but if you live with other people or are easily distracted and not naturally organized (sounds like me), you really need to find a dedicated office and/or craft studio space in your home. 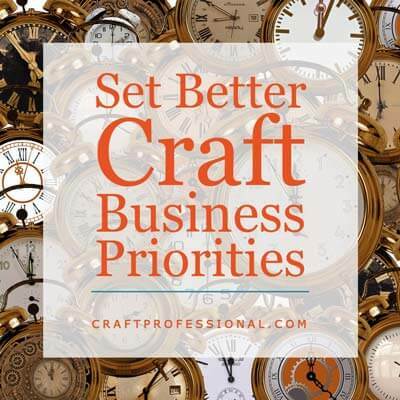 Your office and/or craft room does not have to be expensive or huge (unless you need to accommodate large projects or equipment), but it is important to give yourself the space, tools and equipment that you need to work efficiently. 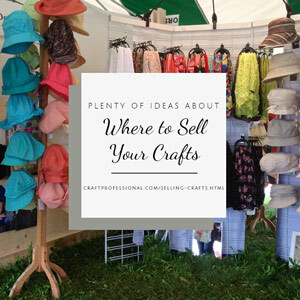 Are you tired of photos of craft rooms that are pretty but clearly not functional? 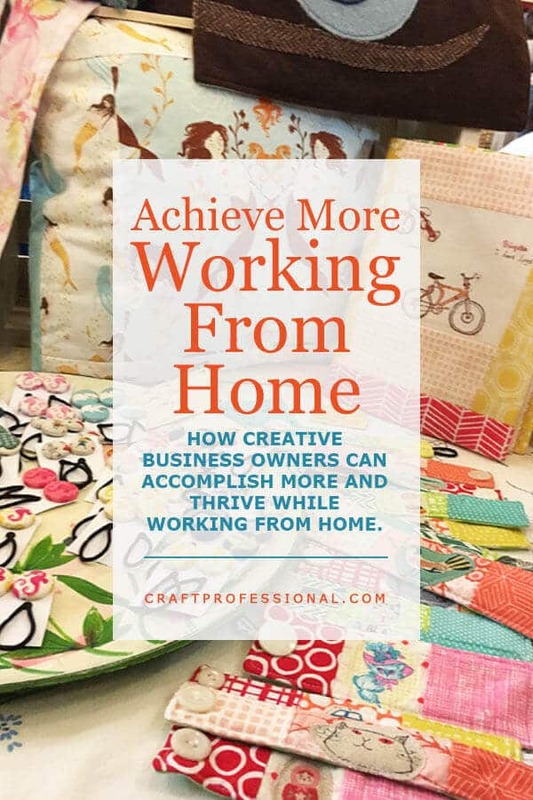 If, like me, you look at certain craft room pics and think sure, it's pretty, but no one actually works in that room, than you need to check out Inside the Creative Studio. Inside the Creative Studio is full of great photos of inspiring art studios that are set up for real work. I'm always on the lookout for craft room and craft storage ideas, and I save them all on Pinterest. If you click the follow button on the Pinterest widget on the left, you can check out plenty of craft room ideas and keep up with new pins. Looking for even more craft room ideas. You'll find more articles at the link above. Another shock I had when starting to work from home was having no technical support and no administrative support. It's amazing how much you rely on your colleagues in a traditional work environment, and how much you miss those people when they're not there. Learning to work without administrative and technical support when you are used to a more traditional work environment can be a bit of an adjustment. 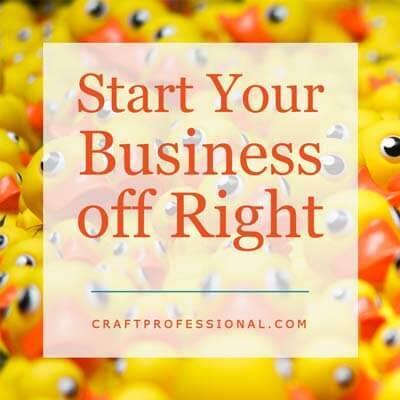 Get ready to launch your craft business. 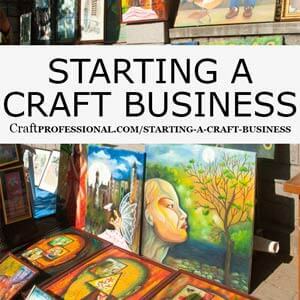 19 ways to build a craft business.